I was at a cocktail party with my husband. Do nothing? Really? I had to giggle. This woman obviously didn’t know my bursting-at-the-seams life of cleaning and cooking, gardening, driving, loving, meal planning, shopping, learning, writing, reading and educating the next generation. My staying at home was equally full of intense satisfaction and occasional frustration. Tears and laughter. But never, never ever boring. Instead of coming back with a witty retort, or trying to justify my stay-at-home-ness, however, I just smiled. I’m a show, not tell kind of person. The woman likely wouldn’t likely have believed me anyway if I tried to correct her falsehood, and I didn’t think anything was to be gained from it. So I smiled, glanced up and when I saw the hostess with a fresh plate of goodies, I excused myself to the chocolate eclairs. Later, this same woman was in earshot when another guest asked me about my new book and another about my nine children. It was a very satisfying moment indeed. Mama, you don’t have to have written a book or have nine blessings to justify your staying at home. One baby takes up all your time. More could take up no more time than the first. Twenty four hours a day responsibility is twenty four hours a day responsibility, no? And so, I’d like to encourage you, whether you have one child or ten, to rest in the knowledge that your staying home to raise your family is important. It is good. It does and will make a difference in the world. Despite the fact we are committed to homemaking and raising our children, when stay at home mothers hear comments like the one I did that evening, it can be easy to devalue what stay at home moms do every day in the heart of the home. The world just doesn’t see much of our efforts on a day to day basis. Keeping a home and raising children is a quiet task, a gentle undertaking, and the formation undertaken within the walls of home may not be evident in public society for years, but don’t let that fool you into believing that what you do isn’t important, or that it doesn’t have profound impact, not only on your immediate family and community, but also eventually on society as a whole. Indeed, as the saying goes, “the hand that rocks the cradle rules the world.” Let’s take a peek at why what you do matters. Every book you read helps your child’s brain development. Studies show time and time again that neurons develop in early on in your child’s brain, and that conversation and active reading helps stimulate neuron growth. Reading helps a child decode symbols- and realize that those little squiggles and lines on a page have sounds…and meaning, and are a way to express ideas. According to one source, regularly spending time with a child reading, explaining, joking and questioning physically alters the way the child’s brain is wired, and that those effects are permanent. Further, there are “learning windows” for certain skills. Capture those windows and the child is set up for optimal learning his whole life. Preschool years are crucial. When you read to your child, you affect his entire future. What’s more, reading to your child provides an opportunity for emotional connection. Every snuggle you share on the sofa with your little one while looking at the pages of a book helps him grow in security and comfort. Hearing your unrushed, soothing voice engaging him in a topic of interest (all the better if pictures are included!) models something valuable that he will likely pass on to his own children, your grandchildren some day. You are participating in a cycle of unrushed love. You are cementing your relationship with your child for life. 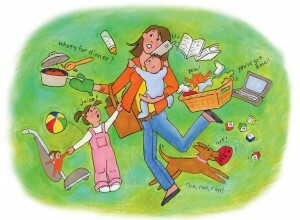 Can you not be a full- time homemaker and read to your children and reap the benefits? Certainly. But it is obviously easier to make the time daily to read when you are home and available. Also, I wanted to point out that reading to your child is far from doing “nothing” or simply being an enjoyable activity. Reading to your child is far from the only beneficial task you undertake as you make your home and raise your family. Every dish you clean, every load of plates you unload from the dishwasher, every room you pick up, every bed you make without complaining and with simple acceptance and dedication to the task shows your child the value of work, of orderliness. Your acceptance of unpleasant tasks sets the stage for your child’s acceptance of inevitable work he too must learn to do. Small things done with great love is the way to be a great Christian. Not all are called to lead armies or demonstrate faith or accomplishments on a public and world-stage. However, everyone can find a path to sanctity in embracing small tasks, doing them well and for the love of God. Little things do matter and children learn that from mothers who make a home joyfully. This short post cannot address all the important undertakings accomplished by a full time homemaker. These above are just a couple examples of why what she does matters. Let’s not forget that a supporting role is an important role. Look at the construction of a building. A gorgeous façade and entryway means nothing if the building isn’t structurally sound. A good solid foundation allows the building to go higher, be stronger, endure inclement weather, and serve its main purpose best. We are the foundation, ladies, for our children, for our families. We are the cement, the base that allows the “building” to soar, to be strong, and to endure. When we provide good example, organization, spiritual strength and a joyful spirit, we are providing our families with a foundation for being exceptional, doing good and accomplishing God’s will in their lives optimally. We are not “doing nothing”. Some women have to work. Others choose to work. I’m not addressing that here. What I’m saying is that being a full time homemaker is valuable, worthy and blessed. But in your heart, I bet you already knew that.